Formula 5000 had been a success by most standards but race promoters were pressing the SCCA to restart the Can-Am series, which had been North America's main road racing series in the late 1960s and early 1970s. They couldn't both be accommodated so the SCCA's Burdie Martin and Lola importer Carl Haas effectively merged the ideas; their new Can-Am allowing single-seater 5-litre sports cars to run alongside the expected new cars. The only new cars in 1977 were conversions of the F5000 Lola T332 series, including the striking Schkee design pictured here. To the delight of race promoters, Tom Klausler won the opening race in the Schkee but thereafter more straightforward Lola conversions won every race. Carl Haas Racing won six and might have won more had lead driver Brian Redman not been injured when his Lola T332CS flipped over at the opening race. Redman's replacement, Patrick Tambay, easily won the championship. Haas Racing's main rival was VDS for whom Peter Gethin won at Road America. 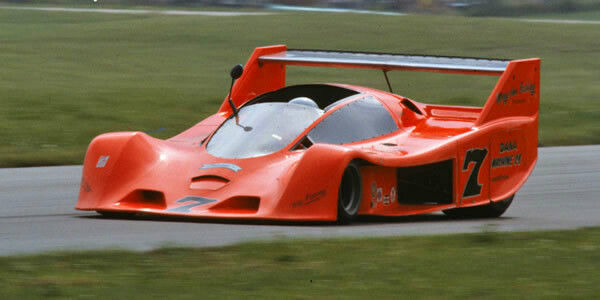 The only constructor to build new cars for Can-Am in 1977 was Lola who were guided by Carl Haas to build a full body kit for the T332C F5000 but also to build a small run of new cars. Amongst the more professional F5000 conversions were Walter Wolf's team's conversion of a Talon F5000 for Chris Amon.